I decided that it was time to get my arse in gear, biking gear that is, as over the past year I have been building up Joe's Bikes and had very little time for riding my bike or anything else. It has been an eventful year, the bike shop has been a challenge but something I have thought of trying to do for many years, it may be many years before it is how we want it but it's work in progress, but definate progress. The shop has been a destraction that has stopped me from doing some things I would have liked to do, such as last years Santa Cruise, I like the idea of doing something at Christmas to put something back into the community, and it is the perfect way of doing it, a bike ride with your mates to make you feel like you have finished the year on a positive note. I did feel sad that last year was not possible and didn't happen, last year I did too much, worked too hard, burned too many candles at both ends, so I had to take what little time I had off to rest. In past years I have asked people to turn up with selection boxes, chocolate etc and swap the booty for a festive beer, a raffle ticket and a smile, in return the chance to ride with my legendary mate Steve Peat is on offer and after the ride a raffle served up with a bit of a laugh and a joke. This years format was similar but the problems with donating chocolate, a food stuff to the usual places was getting to be more of a problem so a change in tack was called for. Me and Steve chatted a little about the subject and my suggestion was that we did something that was a little closer to home. Last year was a strange one with friends coming to grief after riding accidents offering up life changing situations so this would be the direction to aim our fund raising. One of our friends in a predicament is Michael Bonney, we need to remind ourselves of how good life is sometimes and over the last year I have often thought about Michael, his situation is a unique one to say the least, and has frequently made me think how lucky I am. It was decided, this years Santa Cruise was for Michael, it was a bit last minute dot com but most of the best things are, a few texts and phone calls got me and Steve in the same place at the same time and we were on. 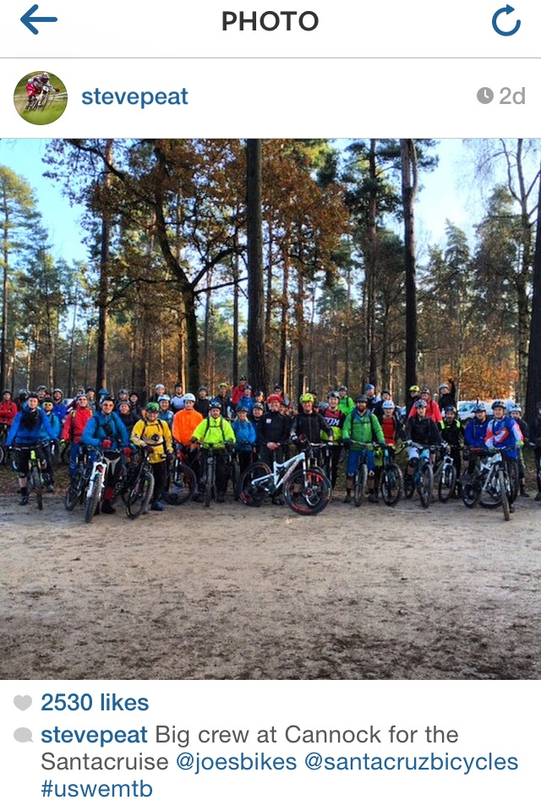 We all congregated in the car park at Cannock Chase at 9:00am we had 2 vehicles full of bikes, bodies, beer and raffle prizes, sounds like mtb heaven, friends, bike industry profs, racers and fans chatted and we all had a group photo. A few brief words by myself about why we were all there was all the reminding we needed to have fun, which was what Michael would love. I found myself leading the pack through the trees over the cobbly trail quickly followed by my 12 year old son Ross on a big Highball carbon, Sandy Plenty was snapping at his wheels on his Nomad but Ross was holding his own, we got out to our first stop and I emailed Steve my photo of the 70 strong group of riders, a short time later two and a half thousand likes had been posted with a variety of comments made, mostly ''wish I was there''. We had a girl called Sarah join us for the first part of the ride, it was her first ride since having a bad accident on her bike earlier in the year, Steve made her day by signing her book and taking time out to talk to her family. 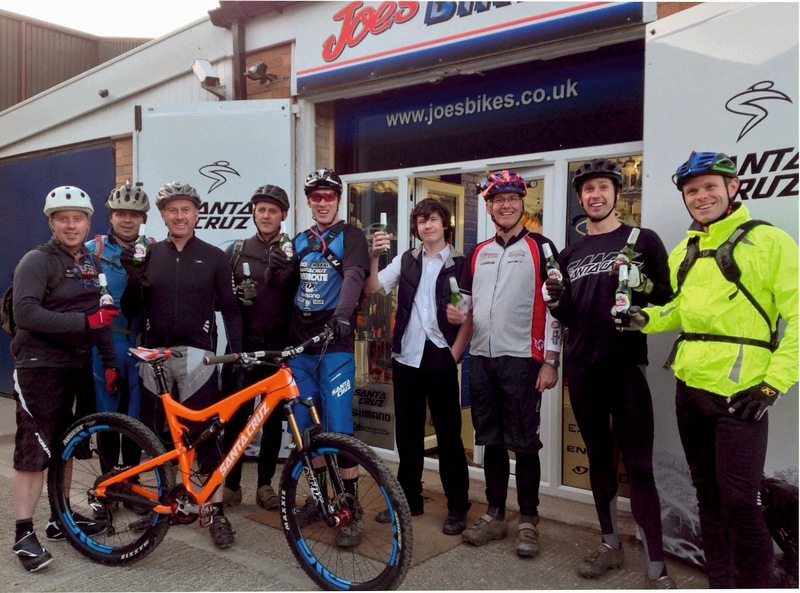 It was nice to see so many of my Joe's Bikes customers turn up and ride, it reminded me how many fantastic Santa Cruz bikes I have helped people with and how beautiful they are. The Chase is a bit tight between the tree's and bar size has gone balistic recently so the new Joystick bars on the Tallboy Carbon I was riding meant It was close between trees, a wheelie and turn of the bars tactic was soon employed to avoid loss of palm skin or fingers to bark. There was a lot of banter on the trail and we had some laughs, there were a few stunts and a few falls but nothing too serious, Lee Redford who is an Elvis tribute act from Bolton dislocated his finger and Andy Appleton dumped his brand new Bronson scuffing it a little and he bent his brake lever, I felt for so sorry him, it felt like a kick in a delicate area when he told me what had done. We got back to the car park and congregated around the van for the Raffle, I had all sorts of prizes, John Chennels from Orange also donated Nathan Rennie's Santa Cruz Syndicate race kit from a few years ago, very generous, I decided to auction this along with some of Steve's signed books and a signed Wont Back Down dvd. Martin who continued to miss out on items in the auctions started the bidding on the Nathan Rennie kit and I pushed up his bids until Sandy Plenty joined in, one of his friends pushed him up a bit as I did but after a few not exactly pc jokes Sandy finally won, well done Sandy, very generous. I'm sure the kit would look better on the wall of Joe's Bikes haha but sure he will find a place for it on the wall, Sorry did that sound bitter? Yes I did really want it, but had to duck out, it was only right. The raffle was a great success and the auction good fun with a bit of banter and some joking around but we raised some good money, I would say how much each thing raised but would not want to incriminate anyone, the names have been changed to protect the inocent, but thanks guys, they know who they are. Packed up and ready for home we went off seeking the most welcoming looking pub we could find on the way home, lots more swapping of stories and talking about the big French and English mustard debate with farmer Jack was a fine finish to the day, Ross made a rainbow of the condiments across the table we had a good meal a few beers, Coka Cola's for the drivers made the journey more bearable and a quick count up on the way back in the van gave us a total of £640 raised, not a bad days work. I hope it goes a small way towards helping Michael, and thanks to all the kind people who donated on the day, I'd also like to thank Endura who donated some clothing and 2pure who donated a POC helmet, cheers Naythan and Chris for helping me with that, very nice people. 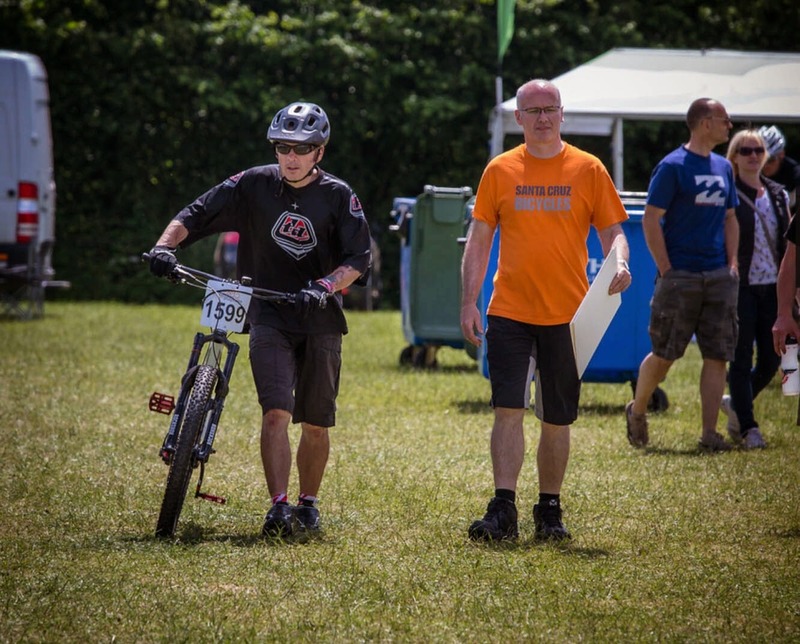 Last but not least I'd like to thank Steve Peat who is always generous with his time, without him it would not have happened, I look forward to doing it again next year, Cheers, see you there. There's a new bike shop opened in Worksop!